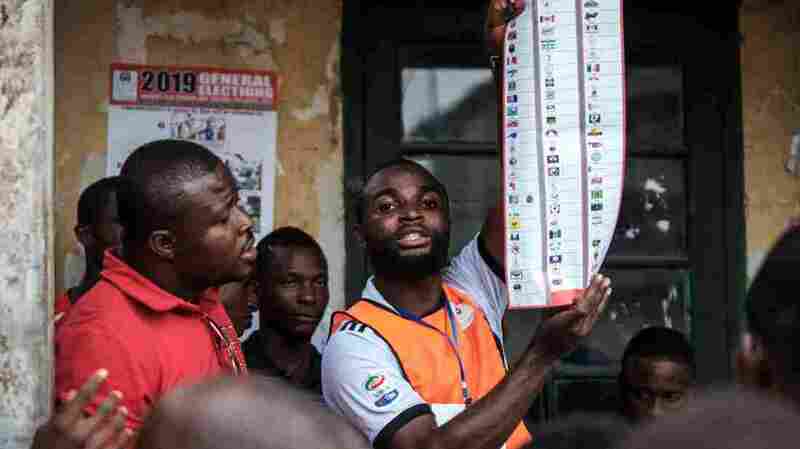 Nigeria Elections: Voters Go To The Polls After 1-Week Delay Vote-counting has started in the much-anticipated election, a week after it was postponed by officials who blamed logistical challenges. Candidates include incumbent President Muhammadu Buhari. Officials count votes at a polling station in southern Nigeria during the country's election, which came a week later than expected. The other front-runner is Atiku Abubakar, a former vice president and businessman who has promised to jump start Nigeria's economy. 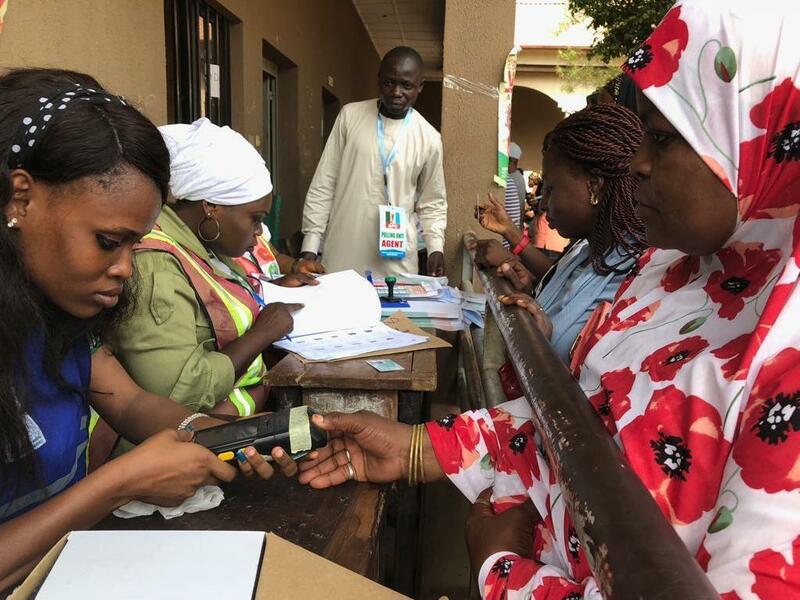 The Associated Press reported both lead candidates cast their votes on Saturday, Buhari jokingly checking his wife's ballot to see how she had voted. Analysts say the race is too close to call, AP reported. But both candidates have said they're confident they will win. On Saturday, Buhari responded to journalists asking if he would accept defeat and congratulate the winner if he loses: "I will congratulate myself," he said laughingly. "I'm going to be the winner. Thank you very much." Buhari's main challenger, Abubakar, also answered confidently when asked about the outcome of the presidential vote. "I look forward to a successful transition," Abubakar said. Asked what he would do if he loses, he replied, "I am a democrat." Observers say preliminary results are expected in two to four days, according to The Washington Post. Voters cast their ballots at a primary school-turned-polling station on Lake Chad Crescent. The presidential candidates renewed a pact last week aimed at keeping the election peaceful. Four years ago, Buhari was the first-ever opposition candidate to defeat an incumbent president. That election was mainly peaceful, but past elections haven't been. "This government will do its very best to ensure that the 2019 elections take place in a secure and peaceful atmosphere," Buhari has vowed, as NPR reported. But gunfire and blasts were heard in several cities before the polls opened. According to Reuters, suspected Islamist militants attacked a town in northeastern Nigeria on Saturday morning. The Islamic State West Africa claimed credit, but, at first, the army denied there was an attack, Reuters reported. According to AP, Nigerian security authorities have since acknowledged the attack. Residents told Reuters they fled in response to the attacks: "We are right now running and hiding in the bushes," Yobe state resident Ibrahim Gobi said. According to AP, some Nigerians said the extremist attack in the country's northeast kept them away from the polls. Other factors might impact voter turnout, too. After last week's delay, many Nigerians were angered by the last-minute change and said they wouldn't vote. But on Saturday, there were long lines outside a primary school in the capital Abuja, where men and women, some with babies strapped to their backs, stood under the scorching sun, waiting to vote. The main issues on voters' minds are the economy, security and jobs. "I'm voting for continuity," Ruka Ajana, a voter, told NPR. "I'm voting for the building of a foundation on which future governments could build on ... [so] a dog can be a president in Nigeria in the future and everything will still work." 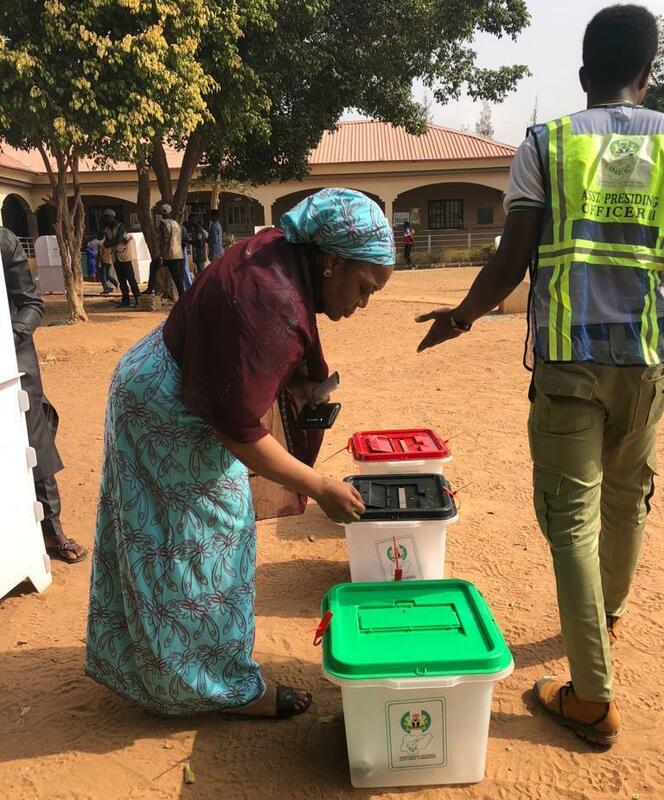 Ruka Ajana casts her ballot at a polling station in Abuja, Nigeria's capital. Gbenga Komolafe told NPR he voted with the country's economy in mind. "The priorities are to strengthen our democracy, to get the economy right," said Komolafe. To him, that means reducing unemployment and making sure the country is secure. Komolafe is in his late 50s, but many voters skew younger. "Half the population here is a very youthful population," NPR's Ofeibea Quist-Arcton said Sunday in an interview on Weekend Edition. "They want whoever their new leaders are to really make sure that the potential wealth of Nigeria is shared." Security is also a major concern; in the northeast, the Boko Haram insurgency continues, and in central Nigeria, herder-farmer conflicts over land and grazing rights have cost hundreds of lives. "These are the issues," reported Quist-Arcton. "They want to see stability, they want to see prosperity."